Lubbock  is the largest city in the Great Plains region of Texas and serves as the area’s agricultural and economic hub. Lubbock, commonly known as the Hub City, is in the center of the South Plains, an expansive cotton-growing region. Lubbock has experienced steady growth for several decades and today occupies approximately 125 mi² (324 km²). The city is home to approximately 230,000 residents and students. Lubbock is the seat of Lubbock County, the site of state and national parks, two major medical systems, three universities, and is unique among other growing Texas cities in that its sustained economic development and growth are not supported by heavy industry. Charles Hardin Holley (1936-1959), better known by his stage name of Buddy Holly, was born in Lubbock. Together with Elvis Presley, he is considered to be one of the founding fathers of rock-n-roll. (In fact, it was watching Presley in concert in Lubbock that led Holly, originally a country and folk singer, to turn towards rock music.) Tragically, Holly’s life was cut short at the age of 22 when he died in a plane crash in Iowa, together with Ritchie Valens and J.P. “The Big Bopper” Richardson. Nevertheless, today Holly still lives on in his hometown by way of the Buddy Holly Center. Lubbock County was founded in 1876 and named after Thomas S. Lubbock, a signer of the Texas Declaration of Independence and subsequent Confederate officer. Mr. Lubbock didn’t have any particular ties to the area; but the area bore his name because a state administrator penciled in names of counties on a crude map of the Panhandle – at random. The modern town of Lubbock was not established until 1890 when old-Lubbock and the smaller town of Monterey struck an unusual alliance and merged the two communities, a deal most likely initiated by rival town promoters hired by area ranchers and merchants to lobby Ft. Worth & Denver for a rail depot. The site of Monterey was chosen in lieu of the new township’s name, Lubbock. Old-Lubbock’s residents relocated to Monterey just south of the the Yellowhouse Canyon, dragging the Nicollete Hotel with them on rollers. Lubbock became the county seat in 1891 and incorporated as a city in 1909. In 1923 Texas Technological College was founded after a contentious bid war among several area cities including Amarillo and Plainview. The city of Lubbock was a mile away from the only campus building during its first session. A category F-5 tornado cut a 8-mile (13 km) gash through the city on the evening of May 11, 1970, resulting in $125 million in property damage and the loss of 26 lives. The devastation received international news coverage and was among the first natural disaster recoveries to be documented on television. The coordinated effort served as a model for disaster recovery research and planning. The destruction of several thousand homes effectively ended segregation throughout the city. Southwest Airlines, United Express, and American Eagle service the small Lubbock Preston Smith International Airport  (IATA: LBB) 5 mi (8 km) north of downtown. Air travel to Lubbock will most likely require a connecting flight in Denver, Dallas or Houston, as there are few direct flights, although Southwest has nonstop flights to Las Vegas and Austin, as well as Dallas and Houston. Cab fare to the Downtown area or Texas Tech is $13 to $18. Fare to the hotels along the south and southwest beltway range from $20 to $25. Royal Coach offers posted rates from the airport into the city. The fare is based on a zoned map ranging from $6 to $24, depending on your destination. Lubbock is easily accessible by car. US 62/82, US 84, I-27, US 87 and TX 114 are well maintained roadways which allow for easy driving in and out of the city. A modern beltway, TX Loop 289, offers a quick shortcut around the city’s notoriously absent congestion. Greyhound has routes to Lubbock from Dallas, El Paso, Amarillo, and a few other places. The closed Bus Stop Diner, on the 13th St. side of the terminal, is rumored haunted by the city’s transients. Travelers coming in from Dallas or El Paso sometimes switch buses in Big Spring, TX. 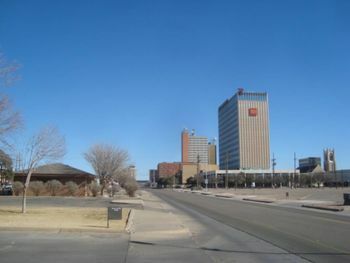 Many northern destinations can be reached by connecting through Amarillo. Lubbock is developed along a large scale grid. North-south streets are labeled A-Z Downtown and progress to city and state names, which also proceed in alphabetical order, moving west. East-west streets are numbered from 1 to 150 or so. Streets north of Downtown follow the names of colleges and universities, while those east of Downtown are flowers and trees. Block ranges, house numbering and street names are consistent throughout the city and most follow alphabetical order. All major roadways are 1 mi (1.6 km) from each other in either direction and are uniformly straight. The intrastate I-27, which connects Amarillo and Lubbock, terminates at the I-40 interchange. The newly-completed Marsha Sharp Freeway allows for quick and easy travel between the northeast and southwest areas of the city. The city’s public transit authority, Citibus, operates fixed bus routes throughout the city. The system relies on a pulse-based schedule which originates at the Downtown Transfer Plaza. A one-way trip is $1.50, and a day pass is $3. The drivers operate electronic fare boxes and do not carry change. Most routes pass through Texas Tech University and the two medical centers. The city is quite large so using the transit may be inconvenient. The city’s only taxicab service, Yellow Cab, is very reliable and offers reasonable fares. Reserving pick-up times is recommended. Plan your trip before calling, as the dispatchers are often extremely busy. It is best to offer your mobile phone number when arranging a pick-up. Drivers will phone you when they are a few blocks away. Yellow Cab also carries several thousand contract passengers everyday so be prepared to wait up to 45 minutes in the late afternoon or early morning. 806 765-7777, Available 24 Hours/day. Lubbock is one of those rare cities where history permeates everything, and as a result most locals know at least something about the city’s history. Most are content with knowing the area, and specifically the city, are of some historical import. There are plenty of folks who are willing to share a few details about their home without repeating the “Buddy Holly is from here” bit. American Museum of Agriculture, 1501 Canyon Lake Dr., 806 239-5796, . W-Fr 10AM-5PM, $3. Founded in 2001 as a cooperative by local agricultural leaders to preserve the area’s history. Also the permanent home of the Lubbock County Historical Collection. The collection ranges from household trinkets to farm equipment and implements. American Wind Power Center, 1501 Canyon Lake Dr., 806 747-8734, . Tu-Sat 10AM-5PM, $3. Offers a unique experience into the history of wind power from the Old West to today. The center has restored 120 windmills which survived the scrap drives during WWII. Most are scattered along the 28-acre (11 ha) grounds shared by the American Museum of Agriculture. The center operates the city’s first wind-turbine which powers the center, the neighboring museum, and 40 homes adjacent to the grounds. Buddy Holly Center, 1801 Ave. G, 806 775-3560, . Tu-Fr 10AM-6PM, Sat 11AM-6PM, $5. The Buddy Holly Center occupies the renovated Ft. Worth & Denver South Plains Railroad Depot. Houses touring and permanent exhibits focusing on music history, local artists and special programs. A giant-size replica of Buddy Holly’s trademark glasses rest on the grounds. The center is the anchor for the Depot District. Louise Hopkins Underwood Center for the Arts, 511 Ave. K, 806 762-8606, . FACILITY IS UNDER RENOVATION. Home to several performing arts ensembles and theater troupes. The Underwood’s galleries feature local artists. The facility includes a performance hall, meeting spaces and a sculpture garden. The Underwood pioneers hands-on workshops and an innovative class series. Silent Wings Museum, 6202 N I-27, 806 775-2047, . Tues – Sat 10AM-5PM, Sun 1PM-5PM, $5. The Silent Wings is dedicated to the glider pilots who trained in Lubbock and nearby Plainview during the second World War. The museum occupies the old Lubbock Regional Airport terminal which was abandoned after the 1970 tornado. Clapp Park/Lubbock Garden and Arts Center, 42nd St. & University Ave., 806 767-3724, . Mon-Sat 9AM-5PM (Varies). The Lubbock Garden is situated in small complex including the Memorial Rose Garden and St. Paul’s on the Plain in Clapp Park. Safety City is a playground which sits along the south end of the park near 48th St. The small city is used to teach elementary school children about traffic safety. Huneke Park/Lubbock War Memorial, 84th St. & Nashville Ave., 806 794-9006, . The memorial opened in 2004 after years of lobby by local veterans. The monument consists of thousands of memorial bricks donated by survivors, veteran’s families and friends. The memorial is popular at night because Huneke Lake has three illuminated fountains colored red, white and blue. Maxey Park/The Kenetic Wind Sculpture, 24th St. & Quaker Ave., Maxey Park is a popular park adjacent to Covenant Lakeside Hospital. There are several public use buildings, a large playground, and a seating area with open grills for outdoor cooking. The Kenetic Wind Sculpture sits in the northwest corner of Maxey Lake. Most locals call them the Totem Poles. Bruce Taylor, designed the sculpture in 1992, and claimed during their induction they are supposed to be cotton fiber molecules. The University Seal & Fountain – University Ave. & Broadway, A 12 ft (4 m) red granite sculpture depicting the symbols for home, school, church and state. Graduates traditionally have their picture taken next to the seal in full gown with friends and family. Park Place – College of Human Sciences, Sculpture garden by Glenna Goodacre installed in 1999. The sculpture’s seven pieces depict the seven stages of human life in honor of the College of Human Sciences. Will Rogers & Soapsuds – Memorial Circle, 10 FT bronze statue of Will Rogers and his famed horse. The student body voted during its installation in 1950 to turn the horses posterior towards Texas A&M University in College Station – traditional rivals. The statue is wrapped in red crêpe paper by the Saddle Tramps, a student organization, before home football games and black crêpe after national tragedies. Student Union Building, Sculpture Garden and Library – 15th St. & Boston Ave., A paved walkway between the newly renovated Student Union Building and Library features several memorial pieces and the controversial Whirlwind series which continues into the Student Union. The foyer and main reading room of the Library also house several sculptures and paintings. International Cultural Center, 601 Indiana Ave., 806 742-2974, . An extension of the Libraries of Texas Tech which focuses on audio/visual studies and education. The center’s libraries contains a far-reaching collection of foreign language film and music. Southwest Collection, 15th St. & Detroit Ave., 806 742-3749, . The Southwest Collection/Special Collections Library houses the Archive of Turkish Oral Narrative , Vietnam Archive , Sowell Collection  and the West Texas Historical Association . The building is behind the gazebo-sculptures at 15th & Boston Ave. and north of the Agriculture Pavilion. The building is marked but tucked away from the intersection. The collection will host an exhibit, “Medieval Southwest: Manifestations of the Old World in the New” from Aug. 13, 2008 through through April 4, 2009. The multidisciplinary collaboration will draw on the expertise of historians, musicians, architects and anthropologists; utilize the resources of Texas Tech campuses on two continents; and tap dozens of collections of rare and precious items to give visitors a glimpse of the Southwest as it was during the days of Coronado and Mission San Sabá. University Library, 15th St. & Boston Ave., 806 742-0737, . Main library on campus and the largest research library in the region. The building was designed to resemble a bookshelf, but the red brickwork and tall white arches give the library a distinctive radiator appeal. The Institute for Studies in Pragmaticism  is on the 3rd floor. Lubbock Lake Landmark, 2401 Landmark Ln., 806 742-1116 , Tu-Sat 9AM-5PM, Mon 1PM-5PM. The landmark is a natural history and archaeological preserve on the northwest corner of the city. Visitors can take a three-mile walking tour of the grounds. The landmark documents and preserves evidence of over 12,000 years of continuous human occupation in the region. The facility is designated a National Historic and State Archaeological Landmark. Moody Planetarium, 4th St. & Indiana Ave., 806 742-2442, . The 78-seat planetarium features a talk radio-style show called WSKY, hosted by Dr. Cosmos. Seating is limited. There is an observatory available to the public at dusk most nights. UNDER MAJOR RENOVATION. Museum of Texas Tech University, 4th St. & Indiana Ave., 806 742-2442 . Founded in 1929, the Museum is a major center of scientific research and houses the Diamond M Fine Arts Collection, portions of the Southwest Collection and a newly construction research center. National Ranching Heritage Center, 4th St. & Indiana Ave., 806 742-0498, . A historical park adjacent to the Museum containing several dozen authentic ranch buildings and exhibits on ranching heritage and the livestock industry. The center is often populated by players depicting life in a late 19th Century ranching town. UNDER MAJOR RENOVATION. Lubbock Arts Festival, . April, 2nd or 3rd Weekend, $15. The largest arts festival in the region combining fine arts, arts & crafts, food and music. The festival traditionally features an exhibit of Texan studio art. Sponsored by the Lubbock Arts Alliance and local businesses. The event grows in popularity each year with 20 to 30,000 attending. Ulterior Motifs, . April or May, FREE. Annual art exhibition sponsored by the Wheeler Brothers Gallery. The event attracts rock, folk and country music acts, performance artists and assorted strange people. The opening celebration often begins in the Depot District and ends with a midnight concert near the Wheeler Brothers Gallery. Ulterior Motifs is heavily promoted as the alternative arts event of the year. Originally conceived as a single event, the exhibition has become an annual feature. 4th on Broadway, . Independence Day, FREE. The largest free festival in Texas! Every year over 100,000 people will walk along the 1/2 mile (4/5 km) portion of Broadway blocked off for the street fair. At dusk the festival moves into the canyon for concert and fireworks. The Lubbock Youth Symphony Orchestra is featured during the fireworks. Space and parking are at a premium, especially in the evening. National Cowboy Symposium, . September, 1st Weekend, $15. A modest gathering of 20 to 50 thousand enthusiasts celebrating the prototypical cowboy. Features music, lecture series, cook-offs and horse show. Fiestas del Llano, . September, 2nd or 3rd Weekend, $5. Cultural festival which focuses on Hispanic history and traditions. Between 10 and 20,000 attend this festival each year. The folk-dance and conjunto banda competitions are very popular. Panhandle-South Plains Fair, . September, Last Week, $20 & Parking $5-$15. The nine-day festival is one of the largest regional fairs in the nation. As many as 300,000 people have been known to tread the fairgrounds during fair week. The carnival midway and concerts are the most popular, especially in the evening. Parking is an absolute nightmare. Take a taxi, but be prepared to wait. Cap*Rock Winery, 408 E Woodrow Rd., 806 863-2704, . An award-winning winery south of Lubbock. Llano Estacado Winery, FM 1585 & US 87 (3 mi (5 km) East), 806 745-2258, . What began as an experiment by biologists at Texas Tech, has become a successful, self-sufficient winery. Wines from Llano Estacado are considered a flagship for Texas wines. The winery will host tours. Call for schedule. Pheasant Ridge Winery, I-27 at Exit 15 (3 mi (5 km) East), 806 746-6033, . A new and very promising winery north of Lubbock. McPherson Cellars, 17th & Texas in the Depot District is the premiere winery. La Diosa Cellars, in the Depot District is a unique, boutique winery. Joyland Amusement Park, Mackenzie Park, 806 763-2719, , $5-$10. A small park with plenty of carnival-style rides, and a tram line. The park also features three rollercoasters, the most recent addition being the shuttle-loop style coaster Greezed Lightning, which was purchased from the former Six Flags Astroworld in Houston. Schedule varies, but open most weekends from spring to fall. Science Spectrum, 2579 S. Loop 289, 806 745-6299, . M-Fr 10AM-5PM, Sat 10AM-6PM, Sun 1AM-5PM, $5-$10. An interactive science museum with over 250 permanent exhibits and touring exhibits throughout the year. The Science Spectrum is well-known throughout the area and very popular during weekends. The OMNI domed theater is in the same facility. Ballet Lubbock, 5702 Genoa Ave., 806 785-3090, . Founded in 1969, Lubbock Ballet is the only ballet company with a pre-professional school in the region. The company’s annual staging of The Nutcracker with the help of the Lubbock Symphony Orchestra smashes attendance records each year. Lubbock Ballet hosts several events and competitions throughout the year. Cactus Theater, 1812 Buddy Holly Ave., 806 762-3233, . The 400-seat Cactus originally opened in 1938 as a second-run theater. The unique venue closed after television and the drive-in fad in the late ’50s cut audiences to a bare minimum. Local notable, Don Caldwell, re-opened the Cactus in the early ’90s as a center for live music in the Depot District. Lubbock Symphony Orchestra, 1313 Broadway, 806 762-1688, . The LSO was first established in 1945 when the city’s superintendent of schools demanded each school have an orchestra teacher as well as a band teacher. The men and women recruited to teach were the first members of the LSO. In 1967 the LSO was reorganized as a professional organization. The orchestra maintains an extensive music score library. OMNI Theater, 2579 S. Loop 289, 806 745-6299, . $5-$10, Call for Showtimes. The only large-format theater in area, and its well-known 60-foot (18 m), 160-degree panoramic screen. Before each screening, a light and sound show shows off the theater’s 80,000 watt sound system, featuring music from local composers. Texas Tech Red Raiders, . Red Raider sports maintain year-round popularity in Lubbock, offering football, baseball, basketball, and a host of other sporting contests. The football team plays its home games from September to December at Jones AT&T Stadium, and the men’s and women’s basketball contests are held at the United Spirit Arena. Note that the women’s basketball team is officially nicknamed “Lady Raiders”, but other women’s teams use the “Red Raiders” name. Public and private education in Lubbock are recognized state-wide and nationally. The economic contribution the city’s education industry makes to this area is brought home during the summer months when business cools compared to the well-known summer heat. Lubbock Christian University, 19th St. & Dover Ave., . A liberal arts, Christian university associated with the Church of Christ. Enrollment varies between 1,750 and 2,500 students. The university attracts a large number of non-religious students. Texas Tech University, Broadway & University Ave., . The largest university in west Texas, with upwards of 30,000 undergraduate and graduate students. The university is a public institution governed by a Board of Regents appointed by the Governor of Texas. Texas Tech Health Sciences Center, 4th St. & Indiana Ave., . Established in 1961 as the School of Medicine at Texas Tech University. The TTUHSC operates regional campuses in Amarillo and El Paso. The University Medical Center  and its associated health system are a service operated in partnership with area governments and the TTUHSC. Wayland Baptist University, 19th St. & Iola Ave., . One of twelve campuses throughout the country, Wayland’s Lubbock facility offers several business certificate and degree programs. Cotton Patch Cafe, 6810 Slide Rd. This joint has the best battered chicken fried steak to be found. Jumbo Joe’s, various locations. Pretty good hamburgers. While there are many locations in town, the one at 1520 Avenue Q definitely has the best burgers and usually runs a $1.99 burger and fries special. Spanky’s , 811 University. The best burgers in town, and most known for their famous “fried cheese”. Spanky’s has two levels to handle the fairly busy lunch hour. Even when busy, the service is quick and friendly. Gardski’s, 2009 Broadway St. They have a spread like Chili’s, you can get chicken dishes, pasta, salads, etc. and the food is amazing and the service is awesome, very friendly. Stella’s Restaurant, 4646 50th St. The city’s best fine dining. The bread they give you before the meal is delectable, and they have many interesting Italian concoctions. Orlando’s, 6951 Indiana Ave. and 2402 Avenue Q . Everything at Orlando’s is unique and exciting. Their minestrone soup is out of this world, as well as so many more of their fantastic dishes. Abuelo’s, 82nd and Quaker – the original location of a hugely successful restaurant that serves delicious tex-mex. Expect a wait for tables on most nights. Great standard fare of enchiladas, tamales, tacos – but also some interesting and delicious gourmet specialties such as grilled shrimp wrapped in bacon, etc. Also, highly recommended sangria swirl margaritas! La Malinche, 1105 2nd pl. Open for breakfast and lunch on Wednesday-Monday. This Mexican Restaurant is the definition of “hole in the wall,” but the food is delicious, cheap, and the locals love it (especially the homemade tortilla chips). Rosa’s, various locations. A good place to go if you are in a hurry. Rosa’s is a fast food/sit down Mexican food restaurant that is a favorite and frequented by many locals. Mi Tio’s, 7412 University Ave. The best place in town to get margaritas. The food is below par, but the drinks are out of this world. You should stop by here for margaritas, then head to Ruby Tequila’s just down the road for dinner. Ruby Tequila’s, 8601 University Ave. Some of the best Tex-Mex in town. The sunset fajitas are by far the best item on the menu. Giorgios Pizza, 1018 Broadway St, just east of the NTS Tower. This place has some of the best pizza and calzones in town. The food is terrific, and the service is great, as you will be greeted as “my friend” even though George has never met you. Please note that this restaurant is only open from 10AM-6PM on weekdays. It is home to the Texas-sized pizza which is the largest pizza in the city. One Guy from Italy Pizza, with two Lubbock locations (1019 University and 4902 34th St. #35) is an excellent restaurant known for its hand-tossed pies and large calzones. The original location has been a favorite of hungry Tech students for more than two decades. Thai Thai, 5018 50th St. The restaurant has made a recent appearance in Texas Monthly, and serves up some tasty food. Be sure to get a Thai tea to wash it down. Thai Pepper, 19th near Covenant Hospital. Another good Thai restaurant. Try the Pad Thai. Choochai Thai, 2330 19th Street, just east of University. This is arguably the best Thai food in the Panhandle, but be warned– if you like your food spicy, stick with the mild or medium varieties. Ordering your meal “spicy” or “extra spicy” is not for the faint of heart (or stomach). The cook is usually very good about making sure that you really want it the way you order it. Rudy’s, Slide and the Loop, delicious brisket, turkey, chicken sausage, and ribs – served with your choice of creamed corn, cole slaw, beans. Fun atmosphere with shared picnic-style tables and self-serve condiments and beverages. Mesquite’s Barbecue and Steaks, 2419 Broadway, is known region-wide for its slow smoked briskets, pulled pork sandwiches, and top-notch steaks. The onion rings are also a local favorite. They also offer a wide variety of Tex-Mex favorites such as burritos and chimichangas. Tom and Bingo’s BBQ, 3006 34th St., Tom and Bingo’s has some of the best BBQ sandwiches ever. Make sure to stop by this great place during lunchtime as they close once all the meat has been served for the day. The Depot District, surrounding the Buddy Holly Center, is the main place to go out for a night on the town. This collection of clubs, coffee houses and live music venues along Buddy Holly Avenue pay homage to Lubbock’s most famous son, and the area’s rich musical heritage. Best Western Lubbock Windsor Inn, 5410 Interstate 27, +1 806 762-8400, Fax: +1 806 762-0303, . Best Western Palms Hotel & Suites, 6015 45th Street, +1 806 799-9999, Fax: +1 806 799-3344, . Embassy Suites , 5215 South Loop 289, +1 806 771-7000,  (the best hotel in Lubbock). During the spring months, weather in Lubbock can grow rather tumultuous in rapid fashion. Weather warnings are not to be ignored during severe weather season. The city is also subject to frequent dust storms during the spring; and while not exactly dangerous, these storms are often severe enough to limit visibility. Drive with care, and give yourself a few more car length’s worth of reaction time. Kadampa Meditation Center Texas , 2801 42nd St., +1 817-303-2700, . Offers relaxation meditations and meditation classes to increase inner peace.